Burnt Bridge Creek runs through the heart of Vancouver, Wash., before eventually connecting to the Columbia River and discharging into the Pacific Ocean. More than $7 million in grant funding from the Washington State Department of Ecology will support stormwater infrastructure projects that improve water quality within the Burnt Bridge Creek watershed by 2022. Williampfeifer/Creative Commons. The City of Vancouver, Wash., is in an important spot for water quality in the Pacific Northwest. The 21-km-long (13-mi-long) Burnt Bridge Creek meanders through the city center, flowing west into Vancouver Lake. The lake, in turn, drains into the Columbia River and, eventually, the Pacific Ocean. For this reason, the city takes great care to manage its stormwater discharges responsibly; the state government is stepping up to help. The City of Vancouver Public Works Administration announced in February that it will receive more than $7 million in grants from the Washington State Department of Ecology to support a host of stormwater-focused infrastructure projects along Burnt Bridge Creek and other local waterways. 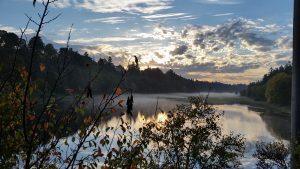 As part of Washington’s Water Quality Combined Funding Program, water quality projects throughout the state can apply for grants from an annual fund ranging from $100 million to $200 million. Municipalities, tribes, and nonprofit organizations who agree to fund up to 25% of the cost of their proposed projects receive both financial and technical support from the Department of Ecology to ensure successful implementation. Vancouver will receive support for five major projects that focus on treating runoff from underserved roadways and industrial areas, as well as an expansion to the city’s inspection program for private stormwater management facilities. Each of the projects are scheduled for construction within the next 3 years. $130,000 to expand private stormwater facility inspections by the city, supporting additional pipe locating services, broader community outreach, and enhanced technical assistance.